SAFE561-54T 5" 6W 70/100v. 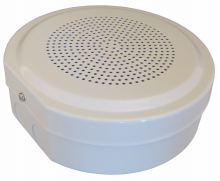 EN54-24 compliant metal cabinet speaker complete with ceramic terminal block and thermal fuse. 1st fit 2nd fit mounting arrangement, to allow full circuit test before final connection. Can be glanded for side entry or into the rear of the unit for discreet cabling. The speaker also has low profile for wall mounting safety.